OLD PARKED CARS. : 1973 Ford Pinto Runabout, Revisited. 1973 Ford Pinto Runabout, Revisited. I asked and the comments have spoken. Last seen here without berries. that's a lot more satisfying than i expected. very satisfying. 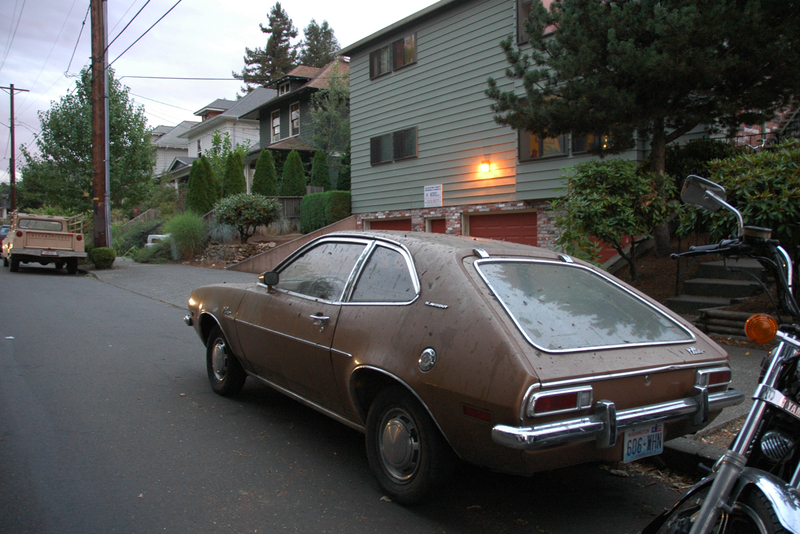 You know it's an upscale Pinto because there's bright trim surrounding the taillight panel. 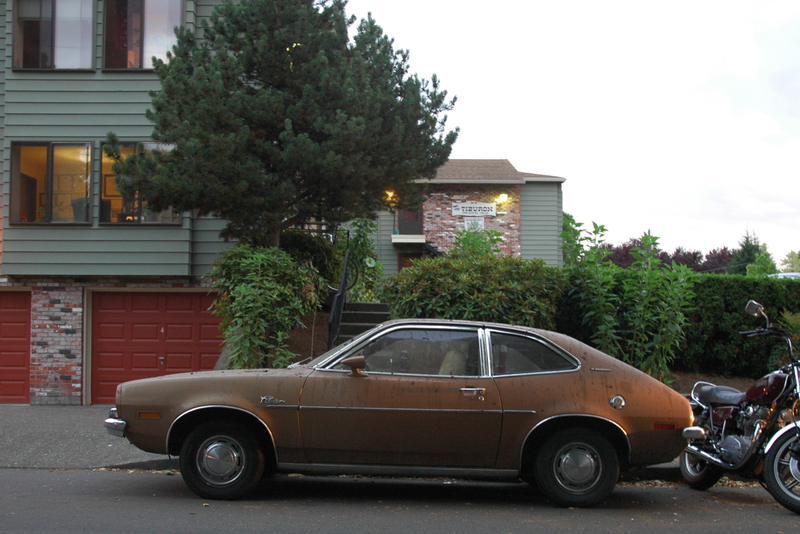 I had a '75 Pinto in baby-poop brown, back in the 80s. I loved that car beyond all reason. That's a '73 at the latest. 1974 got the big bumpers. The berries make it all the better! i notice that the fact that each shot has its own glint of oncoming headlight stimulates some kind of... anticipation? intrigue? and it's still on washington plates, eh? Buddy had a dark green Pinto he acquired from an old relative. We bombed around to high school in it during the early 90's until he bought something cool. Shocking how few you see anymore, because the streets were littered with them for decades. 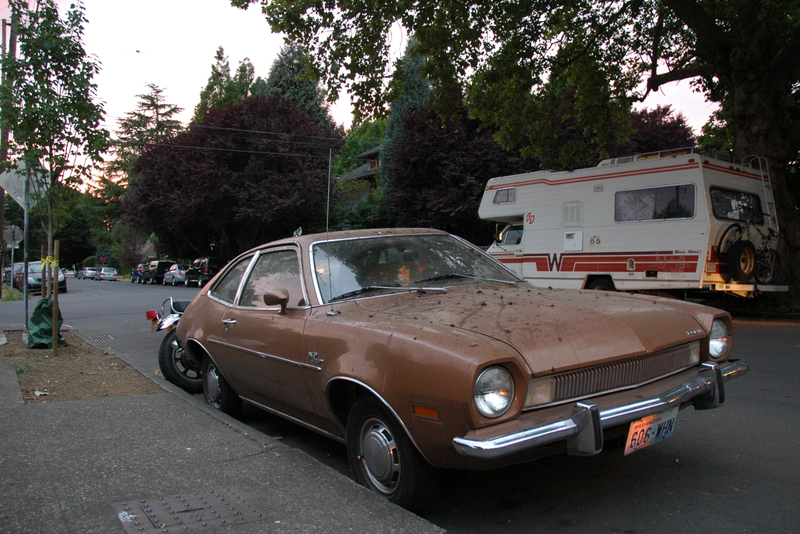 don't care much for or about the Pinto content. is that a Yamaha triple behind it? i think so too, xs. they make great choppers. Those hexagonal headlights...a scampy little scampabout badge...that dont mind me i'm just 'poop brown' paint job. The peoples ford. I'm interested in that Dodge B-series camper visible in the front shot. I am glad I asked for this to be posted again! The porportions on this car are almost perfect, in my opinion. It has got awesome berry patina. 9/10 would drive, can it be a best of? The front is sitting a little high up, does it have an enigine? Any shots of the motorhome in the background? C'mon folks! Sure the Yamaha bike is pretty cool but give him some credit for spotting an older Pinto. I haven't seen one in years and they are getting to be quite rare, especially the earlier makes from '71-'73. Great find! The larger rear window wouild make this one a 1972 or 1973 runabout.